The young English band Equation played for audiences of 3,000 in Southwest England, 60,000 in Belgium, and 100,000 in Glastonbury. Their new label, Putamayo Records, is understandably excited about their first U.S. tour in support of their album "Hazy Daze." The critics are stumbling over each other in an attempt to alert the North American audience that something very special has crossed the pond. 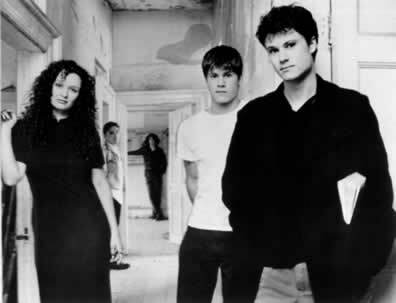 Comparisons to The Cranberries, Fairport Convention, Beth Orton, 10,000 Maniacs, and Indigo Girls may give listeners some idea of what to expect, but the songwriting talents of the Lakeman Brothers, the vocals of Kathryn Roberts (formerly of Kate Rusby's Band), and the accomplished instrumentation will surprise. "Equation weds their hard-earned grasp of folk, blues, and jazz with a mainstream sensibility that results in tracks with the delicacy of Pentangle harnessed to the pop suss of Fleetwood Mac. The range of instrumental colors available to them because of the Lakeman's instrumental virtuosity allows sweeping fiddles and jaunty mandolins to counterpoint the jangly guitars behind Roberts' expressive voice. Impressive," says Mojo magazine. Most of the band is from Dartmoor, "actually a town called Crapstone right in the heart of the moors in County Devon in England," says Seth. Sean adds, "Sir Conan Doyle lived there when he wrote Sherlock Holmes' adventure, 'The Hounds of the Baskervilles.' The mystery writer Agatha Christie is also from this area. We live down the road from Sir Francis Drake's village. The area is very beautiful and very eerie, too. We live in an old haunted house. It's an old Victorian with six bedrooms that used to be a senior citizen home. At one time or another, someone has died in every room." Sam, Sean and Seth Lakeman started playing in their family band, where Mom sang and played violin and Dad sang and played the concertina. It was soon time to break away and write their own music, as they distanced themselves from the more traditional tunes of their childhood. The first record was made while they were still in high school but it did include the voice of Kathryn Roberts, then still under 18 and playing with Kate Rusby. The band began to form, and the result was, and still is, uncommonly beautiful. "After the five of us had been together for only one gig we were discovered by Geoff Travis and signed by Warner almost immediately," explains Kathryn. "Geoff read about us in all the magazines and came to our first gig. He wanted to sign us on the spot. We didn't believe him at first and it took two weeks before we realized that he was real. Then we found out that Geoff discovered the Cranberries and The Smiths and signed them to his own label Rough Trade." Sean adds, "We recorded our album at Peter Gabriel's studio Real World. We spent lots of time in the big room--you know, really luxurious. We'd never been in a recording studio before and here we were in the biggest and most famous recording studio in the world. Our first recording was produced by David Bottrill who works with Tool and all these bands." "The first time we met Peter Gabriel we mistook him for the TV repairman--it was very embarrassing...We couldn't get the TV to work in the front room at the studio and this guy walks in and starts fiddling with the set. We thought he was there to fix it. Then our friend walked in and said, 'oh guys have you met Peter Gabriel?' We nearly died--we had been giving him suggestions on how to fix the telly," confess Sean and Kathryn.